*Now Meeting every 1st/3rd Tuesday 7-8:30 am at The Circuit: April 2nd and 16th. January we focused on “Finding Your Path to Why” with local entrepreneur and innovator, Brad Nix, using his CORE Brand Model. February, we focused on going through the CORE Brand Model (see below) and tackled the areas of Customer Value Proposition and Audience. March we focused on identifying your target audience. April we’ll focus on discovering your business and brand’s onliness. Onliness: The only ______ that ________. What one thing truly makes you different from the competition? We’ll discuss your brand’s onliness factor and why it’s important to know and communicate what makes you different and better using the CORE Brand Model. We started this group back in June 2017 to launch a truly diverse, unique community of entrepreneurs and innovators. We knew we didn’t want networking as usual or a referral group. We wanted to go deeper, build community, solve real problems with real solutions, and help each other be better leaders as a result. Since then we have developed friendships and trusted partners, learned principles of identifying and solving business problems, and built a strong sense of community. 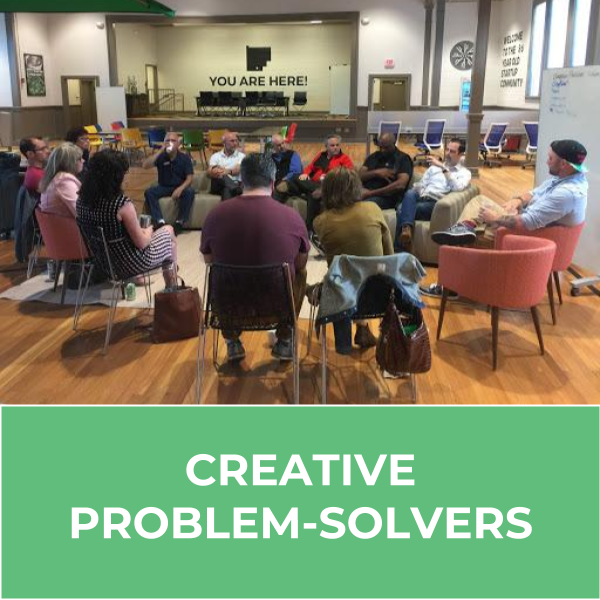 Our Creative Problem-Solvers Meetup, co-led by Jonathan Chambers, Gerald Griffith, and Michael Caldwell, recently did a reset after launching June 2017, refreshing our vision & renewing our strategy to be more focused & strategic. Each month, we will feature a different business topic like mission statements, marketing strategy, talent development, sales, and more and work through the ins and outs. We will continue to meet bi-weekly on Tuesdays with Week 1 being an actionable conversational workshop & Week 2 being collaborative action and accountability. More targeted, actionable conversation with more productive execution but the same organic community.